As part of the “Study on Digital Imaging of Cultural Properties” research project of the Department of Art Research, Archives, and Information Systems, high-resolution images of a color Painting of the Akasagarbha Bodhisattva on silk (a National Treasure) in the Tokyo National Museum were taken on October 5th. This photography was in accordance with a “joint study” between the Institute and the Tokyo National Museum. The images were taken by SHIRONO Seiji of the Institute’s Image Laboratory with the assistance of TAZAWA Hiroyoshi of the Tokyo National Museum; KOBAYASHI Tatsuro and EMURA Tomoko were also involved in the project. The Painting of the Akasagarbha Bodhisattva is a typical Buddhist painting from the Heian Period. Buddhist paintings from the Heian Period display delicate beauty in subtle features that distinguish these works in the history of Japanese paintings. Thus, observing the subtle features displayed is crucial. The project photographed the work as a whole in 28 sections at the highest resolution currently available, and more detailed portions were macro-photographed in 8 sections. The results surpass what is visible with the naked eye. In the future, the Institute will jointly examine the information obtained with specialists from the Tokyo National Museum. OMURA Seigai (1868–1927) was active as an art critic during the middle of the Meiji Period and later in his life contributed substantially to the development of Oriental art history as a professor at the Tokyo Fine Art School. 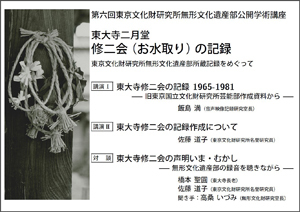 When OMURA’s relatives donated his papers to the Tokyo University of the Arts in 2008, SHIOYA Jun (National Research Institute for Cultural Properties, Tokyo) served as a principal researcher in A Study of OMURA Seigai that began in 2009 through a grant-in-aid for scientific research. On October 18th, SHIOYA presented the results of that research at the 7th Seminar of the Department of Art Research, Archives, and Information Systems. ONISHI Junko of the Tokyo University of the Arts then made a presentation entitled “‘Chinese Art History: Sculpture’ compiled by OMURA Seigai (A description of featured works).” Published in 1915, “‘Chinese Art History: Sculpture’ compiled by OMURA Seigai” was the earliest compilation covering Chinese sculpture as a whole and retains its value even today as a guide for many researchers in the history of Chinese sculpture. 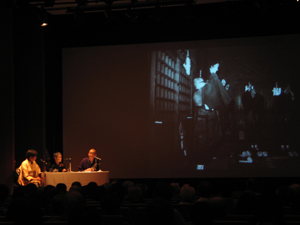 ONISHI described OMURA’s private papers and the texts he himself revised among the materials donated to the Tokyo University of the Arts. 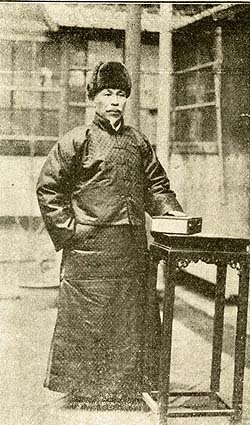 ONISHI also traced the events in the compilation of ‘Chinese Art History: Sculpture’ while identifying research by OMURA and relevant sources. 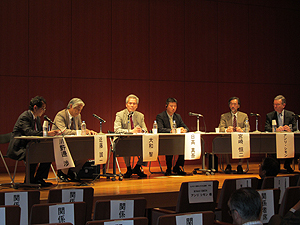 Researchers of the Institute and other facilities such as YOSHIDA Chizuko of the Tokyo University of the Arts, the leading figure in the study of OMURA, participated in an active discussion following the presentations. 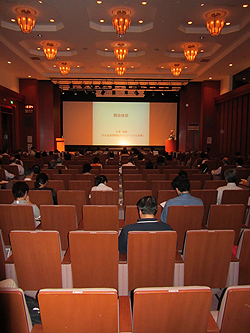 Researchers as well, many of the attendees responded especially to OMURA’s empirical approach as was touched upon in the presentation by ONISHI. 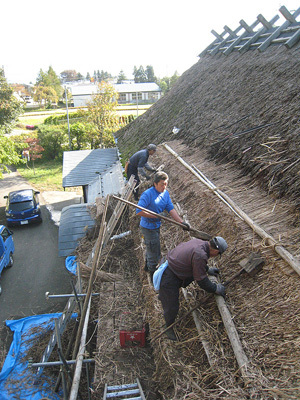 Techniques of maintaining thatched roofs in Akita Prefecture were studied in mid-October 2011. Kayabuki, or a thatched roof, is a general term to explain roofs that are covered with plant fibers, such as Japanese pampas grass, reeds, and Kariyasu (Miscanthus tinctorius) and is a traditional style used on Japanese houses, temples, and shrines. Since Japan’s period of high economic growth, techniques, landscapes, and culture related to Kayabuki have rapidly disappeared. Furthermore, the decline has been spurred by a decline in the number of craftsmen due to their advancing age and the lack of materials due to environmental changes. 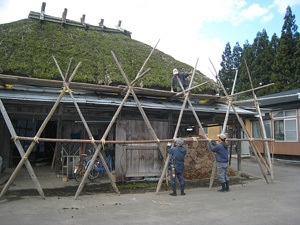 Research was conducted by interviewing Kayabuki craftsmen and studying techniques firsthand with the cooperation of the “Committee for the Transmission of Kayabuki Culture, Akita.” There are basically two types of techniques to maintain a Kayabuki roof: Fuki-kae, a technique to entirely re-thatch a roof, and Sashi-gaya, a technique to partially re-thatch a roof by only changing damaged materials. The Tohoku region that faces the Sea of Japan and that includes Akita Prefecture is unique in the sense that the craftsmen there mostly maintain Kayabuki only by using the Sashi-gaya technique. The current study plans to investigate and record the Sashi-gaya technique in order to understand it as a folk technique and to clarify its cultural importance. On-site training in GPR use at the Boraldai burial mound site. Lecture on analysis of collected data from geophysical surveys. On-site training in measurement at the Ken Bulun site. Five Central Asian countries and China are now proceeding with various activities to facilitate the serial nomination of cultural heritage sites along the Silk Roads in Central Asia as the “Silk Road.” The Japan Center for International Cooperation in Conservation (JCICC) participated in a project to support the World Heritage Serial and Transnational Nomination of the Silk Roads (UNESCO/Japanese Funds-In-Trust project) starting this year and JCICC started various activities in Central Asia. Within the framework of this project, JCICC organized workshops in Kazakhstan and the Kyrgyz Republic in order to teach and train personnel. 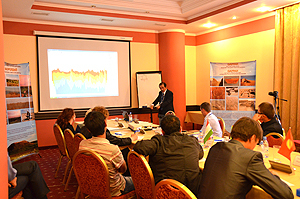 In Kazakhstan, a workshop on methods of geophysical surveying was conducted from September 27th to October 19th in cooperation with JCICC, Nara NRICP, and the Kazakhstan Archeological Expertise Scientific Research Organization. Archaeologists from Kazakhstan as well as from other countries participated in the workshop. 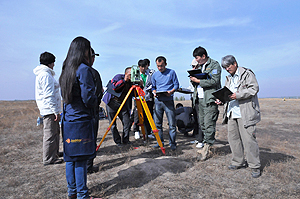 In on-site training during the workshop, ground-penetrating radar (GPR) and electrical resistivity imaging were used at the Boraldai burial mound site near Almaty (Photo 1) and the ancient city of Sauran northwest of Turkestan. Trainees were quite enthusiastic (Photo 2) and learned much in a limited time. Although this was essentially the first attempt at a geophysical survey of archaeological sites in Kazakhstan, results were sufficient to depict buried structures. In the future, the effectiveness of these geophysical survey techniques must be examined and their results must be verified through attempts at various types of archaeological sites and excavations. However, geophysical surveys are sure to be utilized given conditions in Central Asia, where numerous archaeological sites must be surveyed by a limited number of personnel. 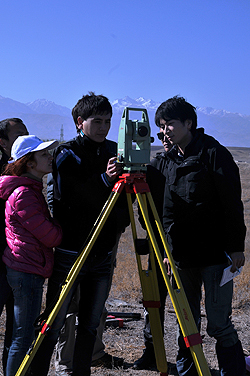 In the Kyrgyz Republic, a workshop on measuring archaeological sites was held from October 18th to 24th. Eight experts from the Kyrgyz Republic participated in the workshop, organized by JCICC, Doushishya University, and the Institute of History and Cultural Heritage of the Kyrgyz Republic’s National Academy of Sciences. After the lectures on the principles and methods of measurement, on-site training was conducted in the medieval city of Ken Bulun (Photo 3). Although the workshop lasted only 1 week, trainees clearly grasped the principles of measurement and learned measuring techniques. JCICC will continue to conduct workshops in Central Asia to teach and train personnel in the protection of cultural heritage. The Japan Center for International Cooperation in Conservation started a four-year training program this year. In this program, a series of workshops covering documentation, excavations, conservation, and site management will be undertaken in the medieval fortified town of Ak Besim in the Chuy Valley of the Kyrgyz Republic. 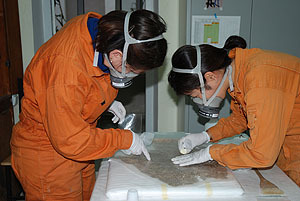 This program has been commissioned by the Agency for Cultural Affairs, Japan and aims to train young experts in Central Asian countries in the protection of cultural heritage in Central Asia. This year, the first workshop was held from October 6th to 17th in cooperation with the Institute of History and Cultural Heritage of the National Academy of Sciences, Kyrgyz Republic and the Nara National Research Institute for Cultural Properties. The main topic of this workshop was documentation of archaeological sites. Trainees received lectures at the Institute of History and Cultural Heritage in Bishkek and received on-site training in archaeological surveys using total stations at the Ak Besim site. A total of 12 young experts joined the workshop as trainees. Eight trainees were from Kyrgyz while the remaining 4 were from the 4 other countries of Central Asia. Every trainee enthusiastically participated in the workshop to become skilled in archaeological surveys. Another important result of the workshop was the friendships that were fostered among trainees through the workshop. The Japan Center for International Cooperation in Conservation plans to conduct various workshops for the protection of cultural heritage in Central Asia in the future as well. From October 9th to November 8th, a 12th mission was conducted on the Conservation of Wall Painting Fragments in the National Museum of Antiquities of Tajikistan. 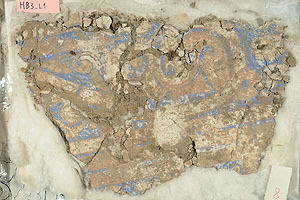 This mission conserved wall paintings from the 11th-12th centuries unearthed at a site in Khulbuk in Southern Tajikistan. 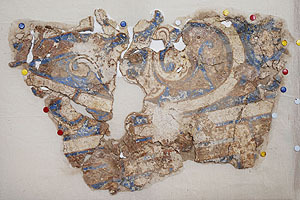 Wall paintings at the Khulbuk site are relics of the earliest Islamic art in Central Asia and are items of unmatched value. 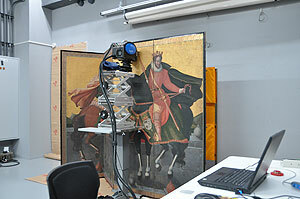 This conservation project was undertaken with a grant from the Sumitomo Foundation. Most of the wall painting fragments unearthed from the Khulbuk site are no thicker than 1 cm. Overall, the fragments are severely degraded and are so brittle that they cannot be handed. In light of the results of trial conservation work in 2009, the 12th mission enhanced the layers of color in 3 fragments, cleaned them, and attached a backing to them. The surface of the wall painting portion was sprayed several times with a solution of Funori – (glue made of seeweed), the layers of color were brought out to a certain intensity, and then the portion was cleaned. Afterwards, small, loose pieces that had broken off were placed back in their correct position. To protect the replaced pieces and stabilize the fragment as a whole, a backing was provided with triaxial woven fabric to readily conform to the contours of the back of the fragment. Subsequent missions will look into ways to clean other fragments, attach a backing to them, and mount them. 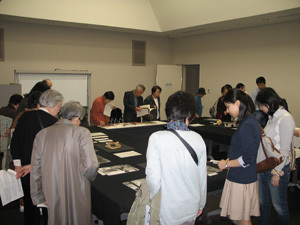 A symposium for the public was held on October 16, 2011 in Heiseikan of the Tokyo National Museum. 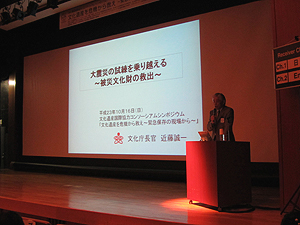 The lectures covered diverse topics such as efforts to preserve buildings, folk cultural properties, and written cultural heritage damaged by the Great Hanshin-Awaji Earthquake and the Great East Japan Earthquake. Topics also included assistance to safeguard cultural heritage abroad. Discussion of emergency efforts to rescue cultural heritage reaffirmed the need for Japan to capitalize on its experience in safeguarding cultural properties damaged by disaster and to cooperate in future international efforts to safeguard cultural properties damaged by disaster.